In January I am going to be holding a beginner’s introduction to quilting class. Times and dates are not set yet but would like to know if anyone is interested and if so, could you please let me know as soon as possible. I was thinking of starting the classes with a baby quilt made from a jelly roll! Not strawberry jelly and cream but strips of fabric that when joined together make a beautiful quilt. 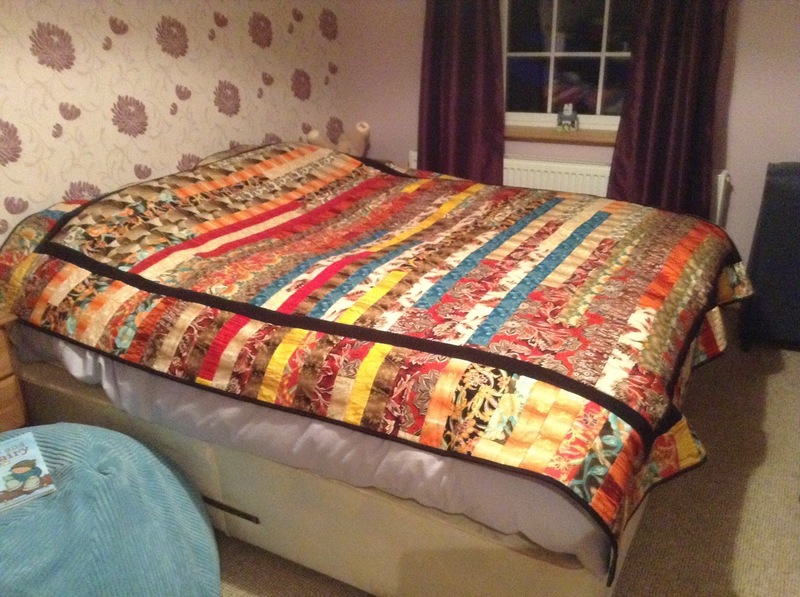 The picture shows a king size quilt using 2 large jelly rolls. They are very simple to make and a good introduction to quilting. 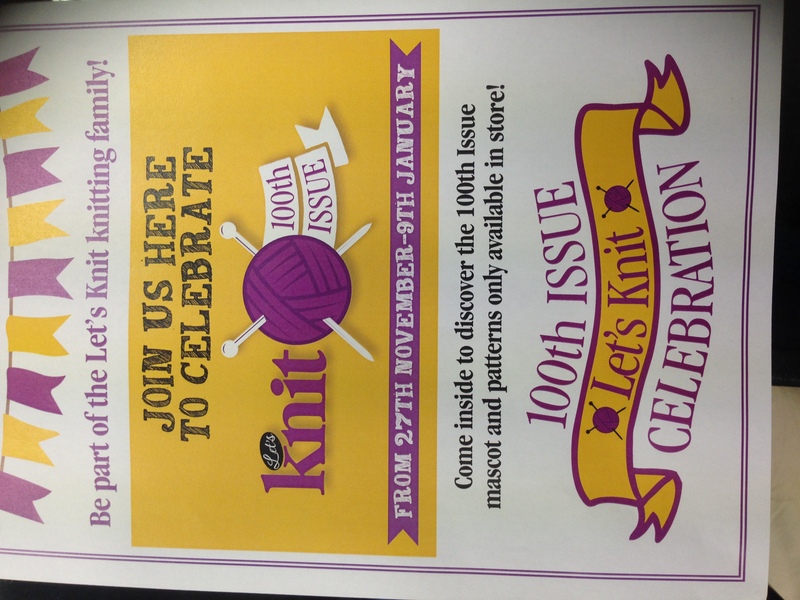 Grandma’s Attic is very excited to be part of the Let’s Knit 100th Issue Celebrations and will betaking part in special offers and a fantastic draw from the 27th November to the 9th January. There are 6 free patterns plus a free pattern for a Let’s Knit 100th issue mascot. Also with every purchase made you’ll have a chance to enter the special prize draw to win fantastic prizes worth £500!! There is a Hiya Hiya needles set, 2 beauty hampers and four tea hampers to be won. This can only be entered in store so call in and don’t miss out!! There are lots of reasons to visit Grandma’s Attic throughout the rest of November and all of December so don’t be shy, come on down and have a browse. There is never any obligation to buy and it cost’s nothing to look and admire. Lots of inspiration available free of charge!! Good Morning fellow Knitters and welcome to winter!! After a very mild autumn it would seem that knitting weather is finally upon us. But don’t be fooled Christmas is just around the corner!! The Christmas fayres are starting and the Christmas songs are belting out in the shops! What have I got this year that is new to the market? Well, we have lots of hand knitted and crocheted garments that would look lovely under the Christmas tree for that someone special in your life. Hats, scarves and the ever popular ponchos for all ages and some quirky gifts for that person who is very hard to buy for. Mug warmers, cafetiere covers and tea cosies. We also have packs to give to the knitters in your life. For the young ones just starting a life of crafting we have some lovely cute little items to be made. Owl back backs and soft toys, or simply buy a pair of needles and a ball of wool and let the imagination flow. There are a lot of wools this year with a tweed look and lots of wool content so nice and warm as well as looking beautiful. We have the ever popular Melange chunky in fabulous colours and of course all the classic baby wools. Call in and see for yourself and have a chat. Throughout the month of December we will be having a free draw for a Christmas hamper with one ticket for every purchase over £5.00. No limit on entries so call in every day and increase your chance of winning. We also have a free draw for a hamper for the Wednesday Charity Knitters and the Thursday night crafters, so make sure you attend to be in with a chance of winning.